Vice President Faisal Naseem, President Mohamed Nasheed, Speaker of Parliament Honourable Gasim Ibrahim, Managing Director of State Bank of India, Mr. Dinesh Kumar Khara, Deputy Managing Director, Mr. C. Venkat Nageswar, Country Head and CEO Mr. Amritesh Mohan. السَّلاَمُ عَلَيْكُمْ وَرَحْمَةُ اللهِ وَبَرَكَاتُهُ. Before, I proceed, allow me to state how honored I am to be here tonight. I would also like to thank the management and staff of SBI for the plaque awarded to me earlier tonight. It is with great pleasure I extend my congratulations to the management, staff and shareholders of the State Bank of India for their 45th anniversary of operations in the Maldives. Established some 2 centuries ago in India, to Maldivians SBI is not just an Indian bank, it’s also a Maldivian bank in more than one way. It is the pioneer of Banking services in the Maldives and is to many Maldivians, including myself their first bank. When SBI opened their first branch in the Maldives, with just 6 staff and 100,000 rufiyaa in capital, banking services were nonexistent in the Maldives. In those early years until the Maldives Monetary Authority was formed in 1981, SBI was also the banker for the Maldivian government. In these 45 years, SBI’s contribution to the overall development of the Maldivian banking and financial services sector as well as the country in general is significant. Its role in helping scores of Maldivian businesses on their path to success is an undeniable fact. When tourism was first started in this country, SBI was the only bank operating in the country. To this day SBI continues to play an important part in supporting individuals and businesses manage their finances. 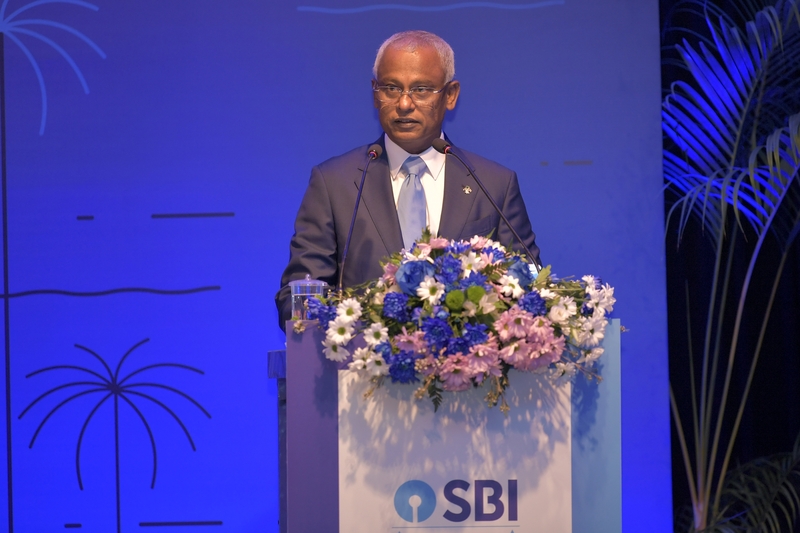 I also note with appreciation, that SBI has also sought to expand its operations in the country with branches now in Addu city, Maamigili in Ari Atoll and Hulhumale. Given the geographically dispersed nature of these islands, providing essential banking services has always been a challenge. Part of the government’s outlook outlined in our Jazeera Rajje concept is to empower local communities to have greater say in how they are governed and to take on development challenges at the community level. It is my hope that SBI too, along with other banks would seek to further expand their network in the country. This is the digital age, and the benefits of digital technology have entered the banking sector as well. This technology presents unique opportunities as well as challenges we and the Maldivian banking sector must also seek to leverage this technology – management culture must be reorientated to align with customer demand for faster and more convenient banking services. This would fit with our Jazeera vision of ensuring financial access to all. Before I conclude I also wish to point out that SBI’s presence in the Maldives is symbolic of the warm relations the Maldives continues to enjoy with India. At a time when our banking industry was virtually non-existent, SBI had picked the mantle and brought this most essential of services to the Maldivian people. For that you have the gratitude and thanks of the Maldivian people.